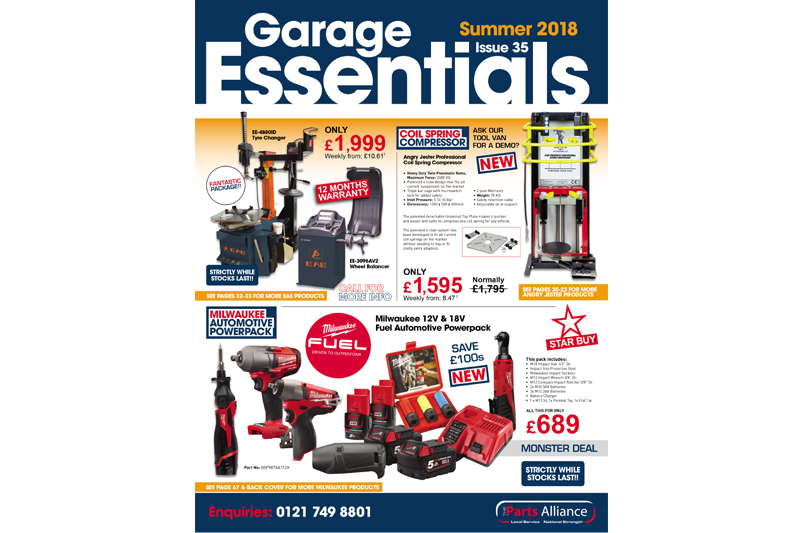 The glossy 68-page summer publication is available on request from all branches of The Parts Alliance members Allparts, Bromsgrove Motor Factors, Car Parts & Accessories, CES, GMF, SAS Autoparts, SC Motor Factors, Waterloo, GSF Car Parts – and now Dingbro too. For garages looking to maximise the opportunities created by power tool battery technology, the Milwaukee ‘Star Buy’ will appeal. At just £689 + VAT it combines several high performance impact drives and ratchets with genuine Milwaukee accessories. Angry Jester, renowned for problem-solver tools exclusively available from The Parts Alliance, has a new air operated professional coil spring compressor for just £1,595 + VAT. Despite the small price, the unit packs a big punch with 2,400kg maximum force and a patented ‘four claw’ connection, ensuring it’s compatible with all current suspension systems.